On every NHL team, the collection of players all bring different skills to the table. There are the players who can generate offense, the players who can hit, the players who can block shots, etc. that make the team strong as a whole. 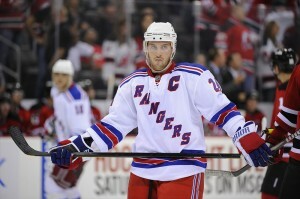 However, the New York Rangers are fortunate enough to have one guy who can do all of these things well. There aren’t too many things that Ryan Callahan can’t do on the ice. The 27-year old from Rochester, New York has quietly emerged as one of the most dependable players in the NHL. This season, Callahan led all Rangers forwards in average ice time with 21:02, due in large part to the fact that Callahan has excelled in all situations. 13 of Callahan’s career-high 29 goals came on the power play this season came on the power play, the 5th highest total in the NHL. But while Callahan has the tools to be a consistent 25-30 goal scorer, he is probably better known for his play away from the puck and in the defensive zone. When Callahan was first called up by the Rangers in the 2006-07 season, he proved his worth by his ability to get in on the forecheck, hit, and willingness to sacrifice his body to block shots. And even as his goal totals increased, the parts of his game that got him to the NHL never diminished. Some have tried to make the point that Callahan has actually hindered himself by playing the way he does. Callahan probably would have reached 30 goals last season, but missed 19 games due to a broken hand as a result of a blocked shot, and the last two regular season games and the Rangers’ first round series against the Washington Capitals with a broken leg caused by a Zdeno Chara slapshot. In Game One of the Eastern Conference Quarterfinals, Callahan’s night was emblematic of his season, and the majority of his Rangers’ career. In a tight-checking first period, Callahan scored on a rebound to give the Rangers a 1-0 lead. Late in the 1st period, when the Senators began to amp up the pressure on the Rangers’ defense, Callahan delivered two huge hits within 14 seconds of each other, the first on Matt Gilroy behind the Rangers net, the second on Jesse Winchester in open ice. Callahan finished with a team-high seven hits, was on the ice for half of the Rangers’ power play and penalty kill, and finished as the game’s #2 star. The admiration that Callahan’s teammates have for the way he plays made him the perfect choice to be the Rangers’ captain before this season. The way that Callahan leads by example and has emerged into the captaincy has been at a level that makes ‘The Captain’, Mark Messier, proud. Outside of his own locker room, Callahan has been talked about as a possible choice for the Selke Award, given to the league’s top defensive forward. But there is another trophy that Callahan would like to accept first that is also awarded in June. And like everything else, Callahan’s teammates will follow his lead.